'Mac Won't Play DVD' Solution | Fix DVD not Playing on MacBook Pro/Air/iMac/iMac Pro etc. - Everytime I put a DVD into my MacBook Pro, the disk spins around and then it is ejected. I have tried repairing permissions and lots of different DVD. Help? - I want to use my Mac to present a DVD with projector. I put it in my Mac and the DVD player pops up. But when I press Play, it says "Supported Disc Not Available". Why my Mac won't play DVD? Any help would be great! Open Apple communities, forums and we can easily discover the posts with title "Mac won't play DVD". Why sometimes DVDs cannot play on our Mac computers (MacBook Pro/Air/iMac/iMac Pro etc.) and how to fix the problem for playing DVDs on Mac smoothly? Read on to get answers. WinX DVD Ripper for Mac - An expert DVD ripping program for Mac Convert any DVD (like home-made, commericla DVD movies, workout DVD etc.) 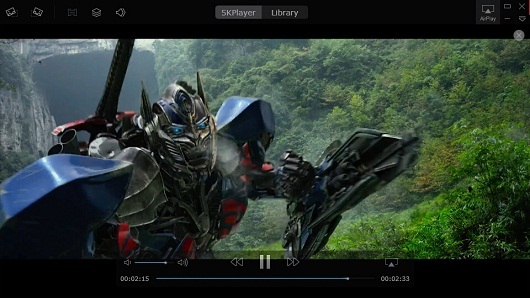 to MP4 (H.264), MOV and other formats accepted by QuickTime or other video players for Mac helping you watch DVD contents on MacBook Pro/Air, iMac/iMac Pro etc, without trouble. To fix the issue, we should get the reason why DVD won't play on Mac and then find the most appropriate solution. Situation 1. Mac won't recognize DVD. There are two possibilities for this situation. One is that the optical drive refuses DVD disc and the other is that there is no DVD icon and no recognition even though the disc is well put into the drive. • For the first possibility, it may be caused by a bad or damaged (external) optical drive. So, you need to repair or buy a new one to make DVD playback run well on your Mac. • For the second possibility, you can try to reset NVRAM (or PRAM). Shut down your computer and turn on later. When you hear the startup sound, press and hold the Command-Option-P-R keys immediately until the computer restarts and you hear the startup sound again. Situation 2. DVD Player won't read DVD contents (not working). It probably hits a block when Mac DVD player to read a DVD encrypted with region code which is not matching region code of your DVD player or a scratched disc. It is suggested to rip DVD to MP4, MOV or other video formats supported by Mac and play with QuickTime to solve 'Mac won't play DVD' problem. WinX DVD Ripper for Mac, the leading DVD ripper for Mac available on macOS Mojave (32 bit & 64 bit) and lower versions, support a large range of DVDs from old scratched discs to newly-released commercial DVDs with removal of encryptions like CSS, region code, UOP, Sony ArccOS, Disney DRM and other complex schemes applied on new movies/TV shows, workout DVD etc. This Mac DVD ripper takes full advantage of hardware acceleration to invoke Intel QSV, NVIDIA NVENC to speed up video encoding, decoding and processing. Plus Hyper-threading tech and the utilization of Multi-core CPU, it can give the fastest DVD ripping performance and output a digital file with nearly lossless quality. It offers hundreds of profile allowing you to convert a DVD to AVI, WMV, FLV, WebM, iPhone, iPad, Apple TV, Android, Windows Mobile, Sony PlayStation, Xbox apart from ripping DVD to MP4/MOV. In addition, DVD Backup modes help you 1:1 clone DVD to ISO Image, VIDEO_TS folder or a single MKV/MPEG2 file. 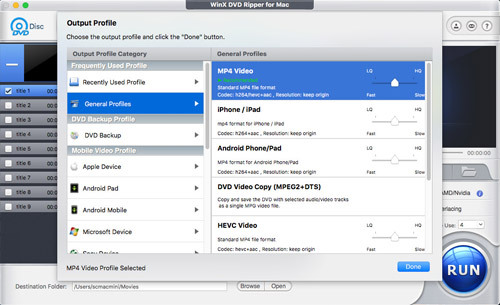 Instead of ripping DVD to MP4/MOV on Mac, you can opt for using third-party DVD player software for watching movies on Mac without DVD not playing problem. 5KPlayer, a versatile media player, allows users to play any regular and encrypted DVDs with great picture clarity. Apart from DVD discs, it can also play ISO image copied from DVD, VIDEO_TS folder and various video/audio files. The elegant and straightforward interface leads users to learn how to play a DVD/video/audio immediately. This best Mac DVD player is a 100% clean and safe program bundled no adware, malware or virus so that you don't need to worry about security problem at all. How to solve if my UDF DVD movie will not play? Read the article and find different solutions to fix UDF format file not playing problems on Windows or Mac.